Hello Thursday! The last time we had a sunny rain free day was when I took these photos this past weekend! We have had nothing but rain this entire week. I like rain, but a little sun would be nice to see! These shoes are a favorite of mine. I have had these for about two years and I still love them. They are perfect to wear with dresses and jeans! Plus, they are comfy! 1. 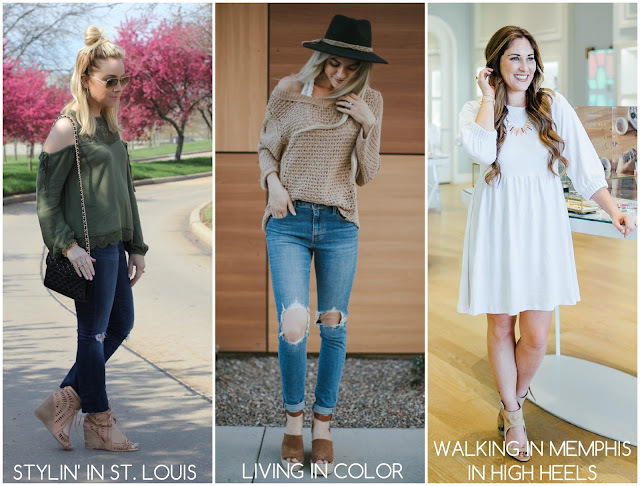 We kindly ask that you follow the two hosts: Elle from Living in Color Style, Jacqueline from Stylin' In St. Louis, and our guest host Laura of Walking In Memphis in High Heels. Spotlight: Our spotlight of the week is Kileen of Cute & Little! 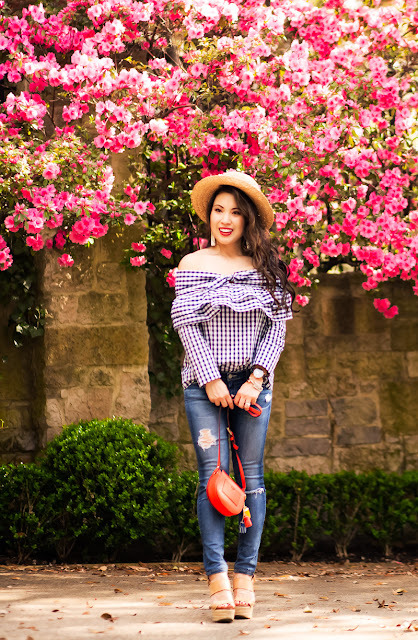 How gorgeous is Kileen's spring outfit? We just love her gingham top! Every detail is perfection! Be sure to check out her cute blog! You look beautiful! Stay chic as always! I'm really loving olive right now. It's the perfect "new" neutral because it goes with so much. I love the depth it gives to your pretty top. The whole look is so effortlessly chic! I am loving that fabulous top! And your sandals are super cute too! I definitely need more shirts like this after seeing yours!! It's so perfect Jacqueline! That top is so cute but what I'm really loving are those shoes! I love the army green top with the cold shoulder detail. Your outfit went up a notch in the cute factor with the top knot. Cute outfit. Your top knot is such a nice choice!